Indigenous Peoples were ‘shocked’ to learn this week that the application of three new Philippine mining firms has been approved into one Financial or Technical Assistance Agreement (FTAA) on Palawan, a UNESCO “Man and Biosphere Reserve” in the Philippines. Approval of this FTAA application will allow the Canadian mining firm MBMI and its Philippine Partners to substantially increase exploration activities and to progress toward full-scale nickel operations in the municipalities of Rizal, Bataraza, and Narra. 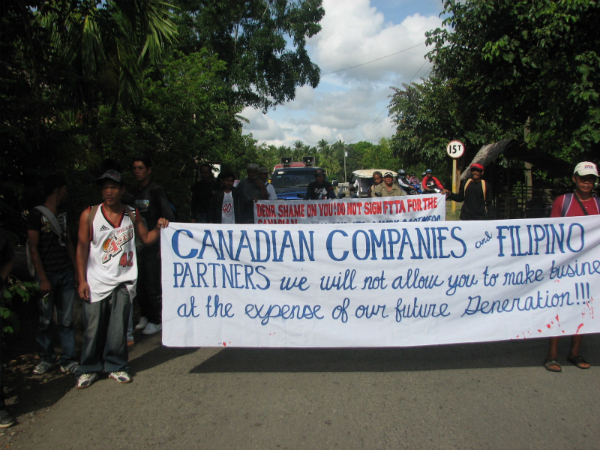 In response to the news–and the ongoing incursion of mining developments in Palawan–more than 500 Indigenous Peoples have arranged to hold a ‘Karaban’ anti-mining rally on 7 June, 2010. While the so-called “responsible mining” rhetoric is being promoted in the Philippines, mining pressure is on the rise and may soon jeopardize the ecological sustainability of Philippines’ Last Frontier. The province of Palawan is part of the “Man and Biosphere Reserve” program of UNESCO and hosts 49 animals and 56 botanical species found in the IUCN Red List of Threatened Species. It is also the home of isolated and vanishing indigenous communities. 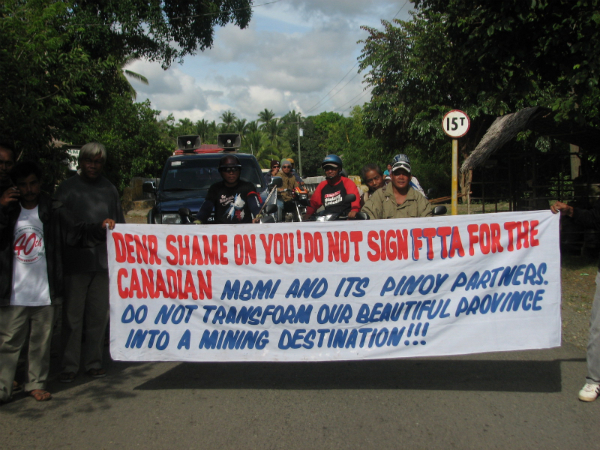 “We are shocked by the recent news circulated through the website of MBMI Resources Inc [A Canadian-based mining company focused on the exploration and development of nickel]” says Artiso Mandawa, National Coordinator of ALDAW (Ancestral Land/Domain Watch). “The mining applications of Narra Nickel Mining and Development, Inc. (NNMDC), Tesoro Mining and Development, Inc. (TMDI), and McArthur Mining, Inc. (MMI) – approved through a Financial and Technical Assistance Agreement (FTAA) – will surely lead to the devastation of precious watersheds, indigenous ancestral territories and productive rice-land. Once again, the rights of our indigenous and farmers communities have been completely bypassed in violation of national and international laws. We will extend any pressure we can to ensure that the Department of Environment and Natural resources will not endorse the FTAA”. Presently, the FTAA of MBMI has been endorsed by the Philippines’ Mine and Geoscience Bureau and is awaiting final approval by the Department of Environment and Natural Resources. Meanwhile, Alyansa Tigil Mina, the largest anti-mining advocacy group in the Philippines, is investigating the issue with the concerned authorities. 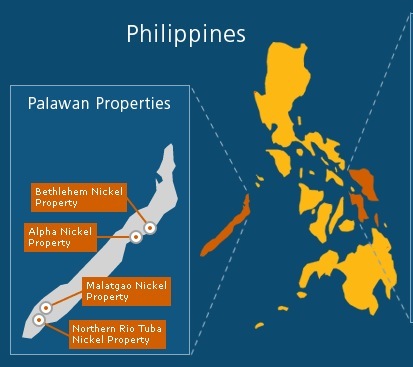 The MBMI based in Vancouver (Canada) holds joint venture interests in Alpha nickel property, a 3,277 hectare property located in Palawan, as well as in Olympic Group of properties, which include Bethlehem, Mt. Bulanjao, and Malatgao properties. In the southernmost portion of Palawan, the Bulanjao range, with its unique ultramafic forest, is one of the best-conserved biodiversity hot spots on the island. A total of six major rivers from the mountain range supply water to both migrant and indigenous population. 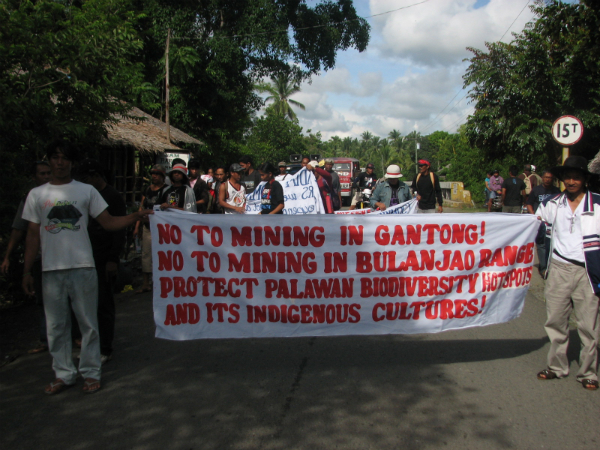 “According to the Strategic Environmental Plan for Palawan the Bulanjao range fall into the so called ‘Core Zones’ of maximum protection, and any mining in the area represents a blatant violation of Republic Act 7611” says Artiso Mandawa. According to ALDAW, the actual “matching” of GPS data to photographs, which they have carried out, has revealed that road construction, as well as mining exploration and extractive activities on Mt. Bulanjao, have already been pursued by Rio Tuba Nickel Mining Corporation. Thus all efforts should be made to safeguard what is left, rather than pursuing additional mining activities in this ecological paradise. 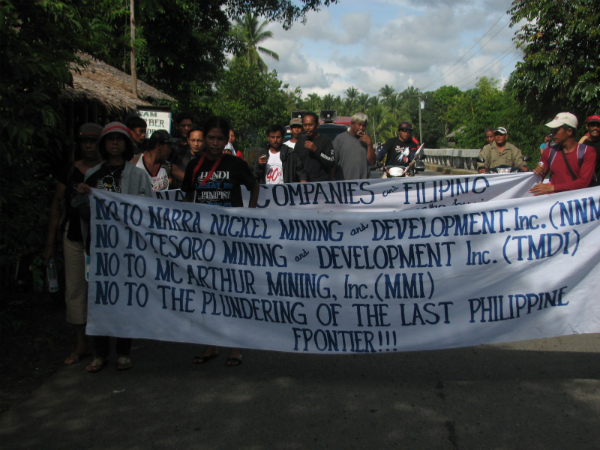 Overall, the Philippine Government continues to ignore the geotagged evidences provided by ALDAW; and MacroAsia, the flagship company of airline and cigarette magnate Lucio Tan (Philippines’ richest man) continues to pursue full-scale operations in the Gantong range, in spite of the fact that its concession includes “core zones” and watersheds which are protected by the law. With 50 meters of trunk from canopy to forest floor, the forest of Mt. Gantong in Brooke’s Point Municipality (Palawan) harbours the oldest trees in the southern hemisphere and several endangered species listed by the World Conservation Union. Maman Tuwa, a senior member of one of the isolated indigenous community of Mt Gantong, fears that MacroAsia corporation will destroy the life of his community: “if our mountains are deforested,” he says “how are we going to survive? What are we going to plant if the soil of the uplands will be washed down to the lowlands. How are we going to feed our children? We’ll surely die”. According to ALDAW, the endorsement of MacroAsia by the Sangunyan Bayan (Municipal Board) of Brooke’s Point is illegal, because it has bypassed local decision-making process and consultations with the affected communities. While waiting for additional permits from other government agencies, the company has already transferred some of its heavy equipment into the area, and this has raised additional concern from local communities. As a result of these ‘developments’, on 7 June 2010, a ‘Karaban’ anti-mining rally has been organized. In the Palawan indigenous language, ‘Karaban’ is the bamboo quiver containing the blowpipes’ darts. It is a symbol of ethnic identity; but, in this specific case, it signifies that people are willing to take whatever action is necessary to stop the penetration of mining companies on their traditional territories. The anti-mining rally will be composed of about 500 protesters and will leave with motor vehicles from the Southern Municipality of Brooke’s Point between 6-7:00am. From there it will head towards the Capital city of Puerto Princesa, stopping in each Municipality along the way, for a 1-kilometre walk. The rally is being supported by various organizations and religious groups such as the Ipilan parish of “Our Lady of Lourdes”, the Global Legal Action on Climate Change, The Environmental Legal Assistance Center (ELAC), the Palawan NGO Network, Inc (PNNI), The Federation of Tribes in Palawan (Natripal) and ALDAW (Ancestral Land/Domain Watch). Participants from different barangays such as Barong-Barong, Aribungos, Ipilan, Mabalot, Calasaguen and Maasin, Brooke’s Point will join the rally, as well as activists from neighbouring municipalities (e.g. Narra, Espanola and Aborlan). The main scope of the peaceful effort will be to request the Provincial Government not to endorse the proposed plans of MacroAsia and Ipilan Nickel Corporation (INC), and to clarify matters on MBMI’s newly approved FTAA application. Says Artiso Mandawa “Gone are the days when indigenous communities were fighting alone for their rights, now we have joined forces with religious groups, irrigators associations, farmers associations, fishermen groups and we have also established strong linkages also with other supporters abroad such as Survival International. This unity is also our strength and our fight will continue until Palawan is declared a No-Go Zone free from mining activities”. 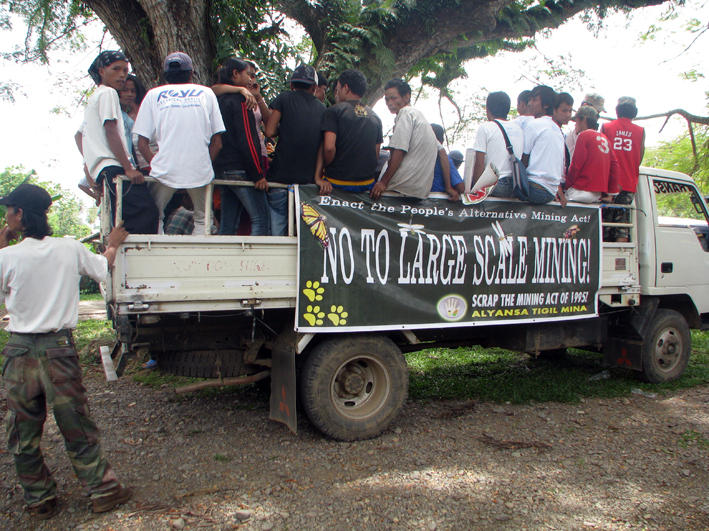 Sign a Petition to Stop Mining in Palawan!